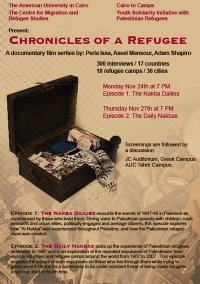 Chronicles of a Refugee is a 6-part documentary film series looking at the global Palestinian refugee experience over the last 60 years. Through the voices of Palestinian refugees, the first three episodes recount the experiences of Palestinian refugees since 1947. They are more historical and informative, presenting an almost comprehensive review of 60 years of dispossession.Starting with 'al-Nakba' (catastrophe) in 1948 (part I) and continuing through repeated community and individual expulsions (part II) and enduring discrimination by virtue of being Palestinian (part III). The last three parts tackle three issues facing Palestinian refugees, and are meant to open up debate on contentious issues. Part IV deals with identity formation and the impact of being in diaspora. Part V looks at strategies for the Right of Return and who is doing what to achieve realization of this right. Part VI focuses on issues of leadership and representation, from the perspective of what kind of representation have Palestinians had over time and what do they want now. Filmed in over 17 countries, 18 refugee camps, 36 cities, with more than 300 interviews of Palestinian refugees who have lived in over 25 countries, this is the first documentary film to look at the global Palestinian refugee experience over the last 60 years. Chronicles of a Refugee gives voice to Palestinian refugees displaced in 1948, as well as to their descendants, and includes a wide range of age, socio-economic status, education level. Part I: "The Nakba Dailies"
Part II: "The Daily Nakbas"
Part III: "Homeland Without ID (papers)"
Part IV: "Identity Without a Homeland"
Part V: "Talk About Return"
Part VI: "The Return of Talk"
and Adam Shapiro, with a musical score by Tarik "Excentrik" Kazaleh and Ramallah Underground. Funding for the project was made possible through individual donations and the film is in no way associated with any organization, political party, faction or otherwise.